T/O Witchford 2243 - target Nuremberg, Germany. Hit by flak and then finished off by a night fighter. Believed to have been the 86th bomber shot down on this operation. 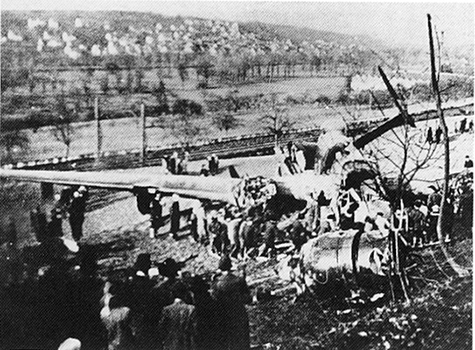 The crew who were on their 14th operation baled out apart from the captain who made an emergency landing at Neckartenzlingen 15 Km S of Stuttgart. 795 aircraft were dispatched - 572 Lancasters, 214 Halifaxes and 9 Mosquitos. 64 Lancasters and 31 Halifaxes, 11.9 per cent of the force dispatched. It was the biggest Bomber Command loss of the war. This would normally have been the moon stand-down period for the Main Force, but a raid to the distant target of Nuremberg was planned on the basis of an early forecast that there would be protective high cloud on the outward route, when the moon would be up, but that the target area would be clear for ground-marked bombing. A Meteorological Flight Mosquito carried out a reconnaissance and reported that the protective cloud was unlikely to be present and that there could be cloud over the target, but the raid was not cancelled. The German controller ignored all the diversions and assembled his fighters at 2 radio beacons which happened to be astride the route to Nuremberg. The first fighters appeared just before the bombers reached the Belgian border and a fierce battle in the moonlight lasted for the next hour. 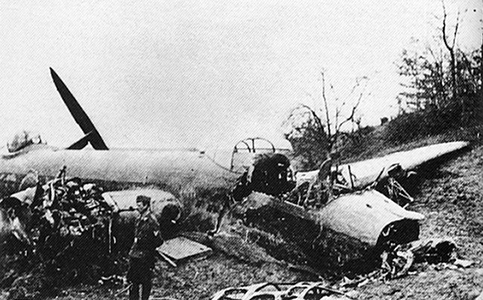 82 bombers were lost on the outward route and near the target. The action was much reduced on the return flight, when most of the German fighters had to land, but 95 bombers were lost in all.